Author: Angelika Mietzner. Series edited by: Norbert Cyffer, Osamu Hieda, Angelika Mietzner, Doris L. Payne, Anne Storch. The Nilotic language family, which consists of the three branches Western, Eastern and Southern Nilotic, extends from Sudan in the North to Tanzania in the South and from Uganda in the West to Kenya in the East. 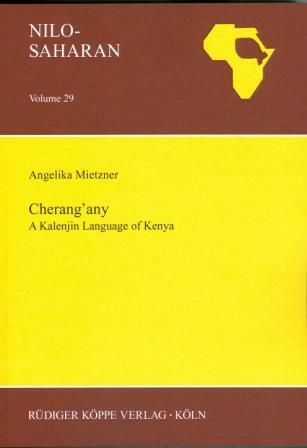 Cherang’any is classified as a Kalenjin language under the Southern Nilotic branch and is spoken in the Cherang’any Hills, a range of hills in the western highlands of Kenya. This volume has been written on the basis of field data that was collected by the author. There is no existing published material on the language of Cherang’any or, as it is also called, Seng’wer. The research for this grammar was conducted between 2011 and 2015 in the Cherang’any Hills in Kenya. The idea for a grammar with an anthropological approach emerged due to the strong desire of the Cherang’any people to show and tell the author, day in, day out, all the details of their culture and history. Therefore, the present study offers a description of the language used in the traditional culture, mixed with the repertoires of people who live in a mobile and dynamic society. The research methods varied in the different stages of fieldwork. During the first trip, the elicitation of word lists and sentences laid the foun­dations for describing the phonology, morphology and the various word classes. In later field trips, the engagement with certain aspects of grammar led to recorded discussions. Narratives were docu­mented and recorded according to the wishes of the Cherang’any consultants. Each and every session was accompanied by long discussions on culture, economy, politics and world affairs, which made it possible to see the Cherang’any’s assessment of themselves in reference to their position in Kenya. A large corpus of texts from different genres was collected in that time. Parts of the corpus can be found on the CD-ROM which is enclosed to this volume. Some elders asked for an output which could be used by the Cherang’any people and which would help them to strengthen their position in the discussion of minority languages and minority ethnic groups. They decided to go for a dictionary, which was published in 2014 (see link below). The present volume will also hopefully help to give the language of Cherang’any more importance in aspects of political discussions.